The Days of Johann, an agility dog! 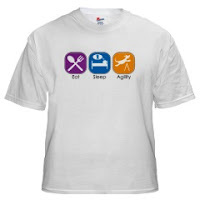 : Cool dog agility shirts and stuff! Cool dog agility shirts and stuff! We scoured CafePress the other day and found some pawsome dog agility shirts. I pawticularly like this one - Eat, Sleep, Agility, BOL! If you'd like to see some of the coolest dog agility shirts on the planet, check out my Squidoo lens - Cool dog agility shirts!